This is the CHS magazine. As you can see it features a female student on the front so straight away we know it is aimed at students. It also features lots of bright colours which immediately catch your eye. Also there are many different sub-headings on the cover page which students can relate to, and this is why they have featured them on the front. For example the title “GCSE RESULTS: why we’re the best” is good because GCSE students can relate to it. “New to school?” is also relatable because many students will be worried about starting at school and they could relate to this and find sanctuary in others people’s views. 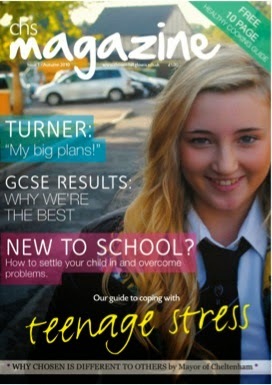 And “Teenage stress” another relatable heading, teenagers who are stressing out and worrying can relate to this also. So the CHS school have tried to make this magazine as relatable as possible with all of the subheadings and also tried to make it eye catching and appealing with the bright colours and big bright, bold font.